by Brianna Crandall — June 22, 2018 — At last week’s 50th NeoCon contract furnishings show in Chicago, design-focused contract furniture manufacturer Keilhauer unveiled its newest furniture collection: Untucked, ultimately walking away with the Best of Competition award (see the FMLink article) as well as Gold in the Lounge Furniture Collections category and Silver in the Furniture Collections for Collaboration category. Two components of the collection also snagged Gold awards: Orign in the Seating: Conference category, and 141 in the Seating: Benches category. The new Untucked soft contract collection is designed to encapsulate the concept of individuality and cohesion that applies to today’s casual workplace. Designed for Keilhauer by EOOS, Untucked features 10 different choices of seating and tables that boast a high level of comfort, a casual at-home style, and a purity of purpose. From conferencing and team break-outs, to one-on-one’s and solo work, each piece is carefully planned and built to perfectly support any of the work and break functions we take away from our desks. Untucked can be used to create any number of vignettes in the modern office. They allow individuals to seek out what they need, and work in a style that best suits the situation — it’s the perfect toolkit to empower your employees, adapt to their needs and maximize their productivity. Though each piece serves a different function, what unites the collection is their shared softening of traditional contract style. The details are meant to make you feel relaxed, casual, and to provide a sense of warmth and invitation. The Untucked Collection is designed according to the belief that people will work better when in an environment flexible to their needs. 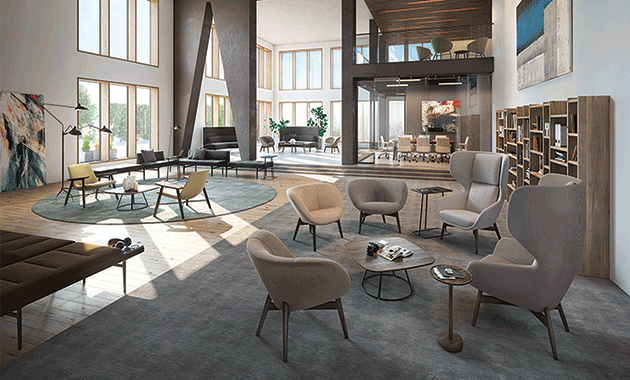 It is designed to support quiet work, ranging from the solitary to the one-on-one; loud work, from team huddles to client presentations; and to create lounge areas where employees or guests can wind down or energize. The collection is designed with “pure intent” — each piece of Untucked fulfills one specific need. Untucked includes strong individual characters that interrelate and play to together. Rather than designing multifunctional pieces, each chair is intended for a particular purpose. It performs one job perfectly. Orign brings comfort to your next conference, says Keilhauer. Its embracing structure is created using two adjoining cushions, gently padded with foam, and an arm silhouette new to Keilhauer — one which incorporates the best features of open and loop arms to form a pi-like (π) shape. Ingenuity hides Orign’s fully ergonomic functions from view, leaving the conference chair to present with a deceptively simple form. Knee tilt functions are entirely internal, as are the spring mechanisms that allow for the seamless absorption of seat and back pressure. Perfect synchronization of movement in the chair’s seat and back is owed to a uniquely engineered connection at the two pivot points, allowing users to lean back to any angle or posture they desire with full support. 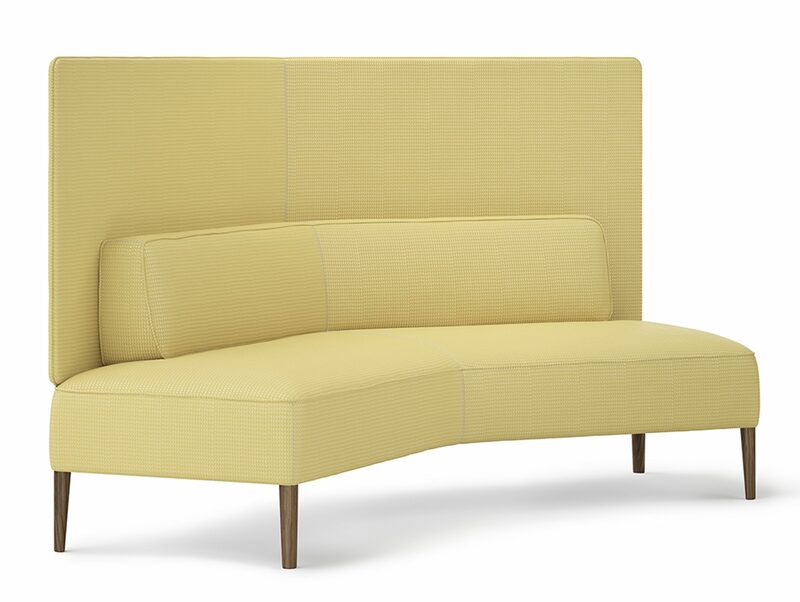 The 141 bench is the newest manifestation of the “magic angle of communication,” says Keilhauer. When developing the award-winning Talk series, EOOS and Keilhauer determined that when two people speak, they naturally turn towards each other at an angle of approximately 141 degrees. By employing this angle into seating design, the piece itself mimics human body language and encourages a natural flow of conversation. Like Talk, 141 is designed to encourage conversation; however, its refreshed look is softer, more informal, and more suited to today’s dominant design trend: “resimercial.” The optional privacy panel blocks visual and auditory distraction; piped edging and clean lines provide high design value; and the unique V-shape encourages eye contact and meaningful dialogue. In short, 141 is a perfect seat for a one-on-one. The modular bench system Parlez can be scaled up or down to accommodate group chats and team huddles of any size. Numerous configurations are designed to create an open and welcoming space that can flow into the larger surrounding environment. Various lengths and components can be configured with and without interconnected tables and arms. The most relaxed way to work, Oro is a crossover lounge/work chair. Controlled pitch and large, oar-like wooden arms provide a worksurface that can be used for tablets, laptops, drinks, magazines and more. The free-floating appearance of the cushioned seat provides a sense of open airiness which, when combined with the arms’ sculpted lines, provides a unique, iconic look. Rove is designed to be the perfect side chair, aka “that extra seat you bring over when an unexpected someone pops in.” Rove’s unique shape is inspired by tension and release. Even in the very first concept model, a confined base appears to contain and compress the chair’s body. As your track up, Rove’s back unleashes up and open — much like a flower bud blooming. This balance of Rove’s narrow base and wide top provides visual intrigue designed to be graphic, warm and welcoming. From the back, Opt appears to be a sharp, small seat, but, as your circle around, the character of the chair is dramatically changed into a casual, wide-open space that encourages wide-open conversation, says Keilhauer. 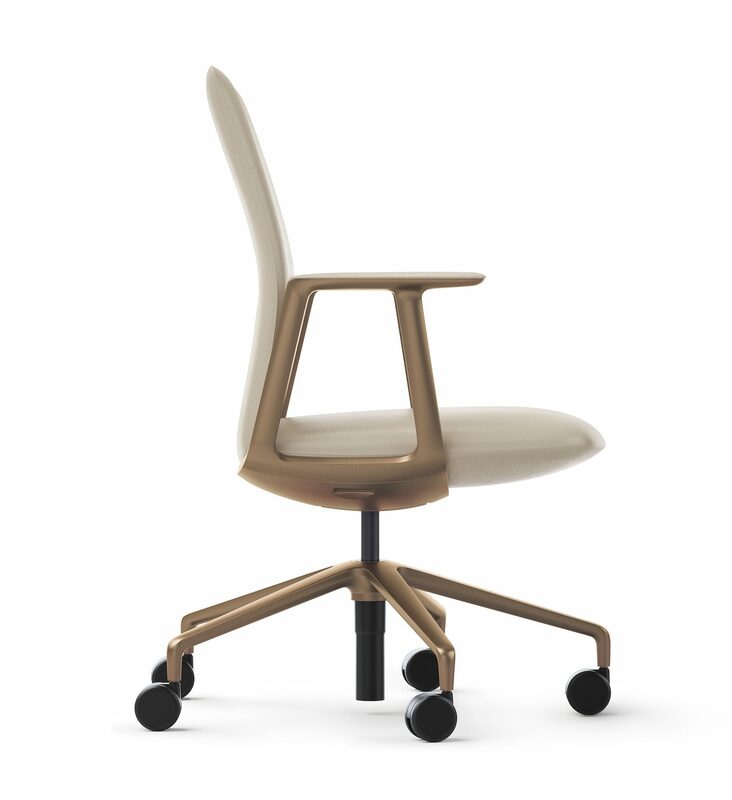 With its easel-shaped legs and provocatively curved back, Opt is eye-catching and a perfect embodiment of EOOS’ unique ability to design into a space that always feels current and impervious to trends. Enhancing the cohesion of the Untucked Collection is a series of three occasional use tables. The Stix side table is as much a mobile wood sculpture as it is a useful perch for books and beverages. Carved from solid wood, the table’s curving lines convey movement and action while generously extolling the virtues of the wooden medium’s naturally round form. During product development, Stix was affectionately referred to as the “weeble-wobble-stable-table,” owing to the table’s contrasting top and base. “The round tablet-like top and the solid block base create a harmonious effect,” says Bergmann. The Bloc laptop table creates a dynamic work surface that complements all the seating options within Untucked. “We love the wire base because it’s an industrial material that allows us to create the most minimal of structures. The base is simply the top in negative space,” says Bohmann. Lastly, the Geometry coffee table series serves to unify the collection. Available in square, rectangular or diamond-shaped, Geometry unites the individual characters of Untucked and transforms them into active communication hubs. As with all its furniture, Keilhauer says the Untucked Collection is built from the highest-quality materials, is designed and manufactured to last for many years, and is supported by Keilhauer’s standard 10-year warranty. The Untucked Collection is expected to carry BIFMA level 2 (gold) and SCS Global Services certification for Indoor Air Quality at the Indoor Advantage Gold level. The products are manufactured in facilities that produce zero waste to landfill and offset 100 percent of electricity usage with renewable energy credits. For more information, see the Untucked brochure or click on the individual product links above. Additional information including finishes, dimensions and model numbers can be found on the Untucked landing page. NeoCon 2018: “Alexa, raise my desk!” Check out Loctek’s Alexa-powered height-adjustable desk and exercise bike/desk combo July 4, 2018 In "Products and Services » Furniture & Furnishings"
New guidance on how your office or institutional furniture should perform, from BIFMA June 22, 2018 In "Products and Services » Publications"
Are your sit-stand desks being used effectively? This app offers guidance and reminders to increase health and productivity June 13, 2018 In "Products and Services » Furniture & Furnishings"